One of our favorite areas to visit is nearby Montrose, so when we heard from subscriber Claudia that a relatively new neighborhood Italian restaurant, Trattoria Allegria, had opened there, we decided to give it a spin. Well, we liked it so much we returned a few weeks later to celebrate Tracy’s speed limit birthday (you have to guess). 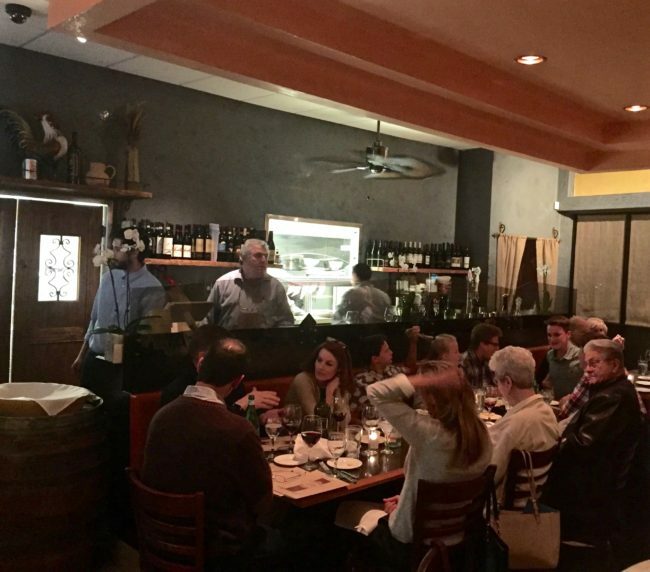 If pedigree is important to you, Trattoria Allegria’s owners have it. 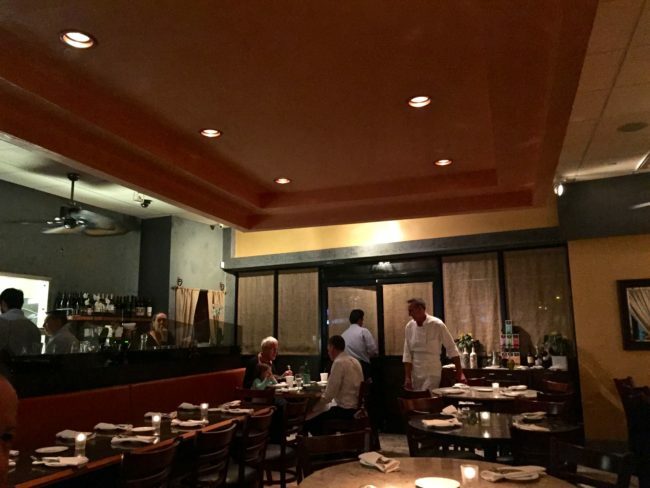 They are admired local Italian restaurant veterans. Antonio Guberti, who formerly ran Glendale’s much-beloved Far Niente, and chef Fausto Tinelli, who for 12 years churned out the terrific dishes at Gale’s Restaurant in Pasadena. 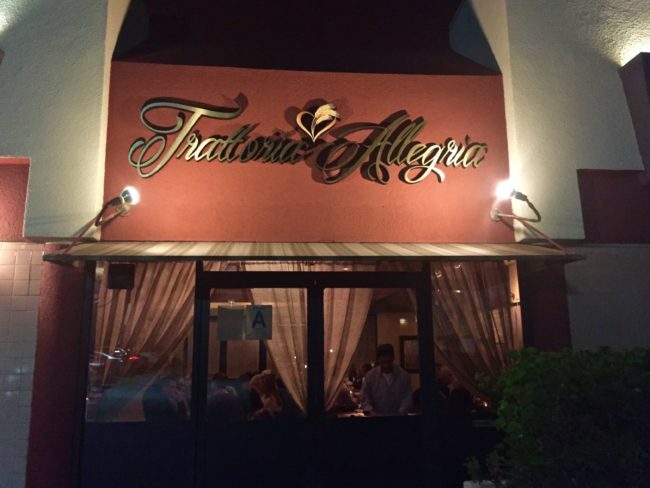 These two have made Trattoria Allegria a popular “go-to” dining spot in a short amount of time. On our first visit, we met our friends Marty and Kim for early Saturday evening reservations (5:45), and although it was quiet when we entered, by 6:30 the place was packed. As we were seated, our waiter brought us cheese, olive oil and fresh bread, which was directly out of the oven. I noticed Guberti scooping the fresh Parmigiano-Reggiono from a nearby wheel of cheese. As we perused the menu, I thought if the meal is as good as this bread and cheese, we’re in for a great evening. 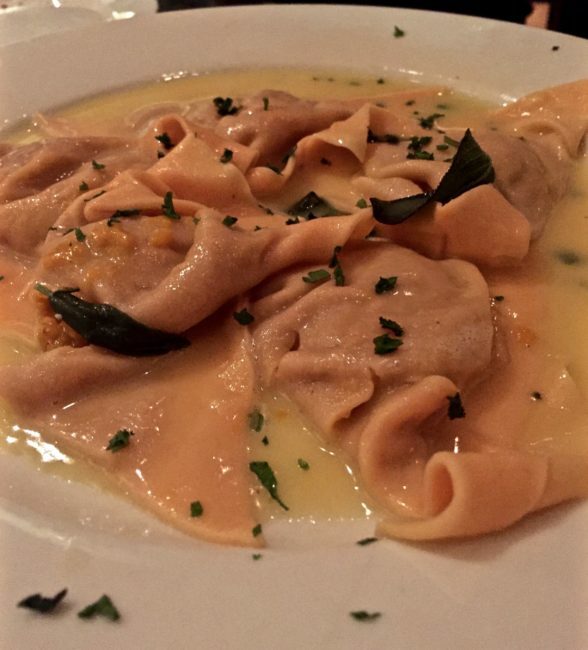 I started with a big serving of Prosciutto e Melone ($12) and followed that with an incredible pasta dish (Kim ordered this, too), Tortelli di Zucca, stuffed half-moon pasta with pumpkin, Parmesan served with a butter sage sauce ($16). 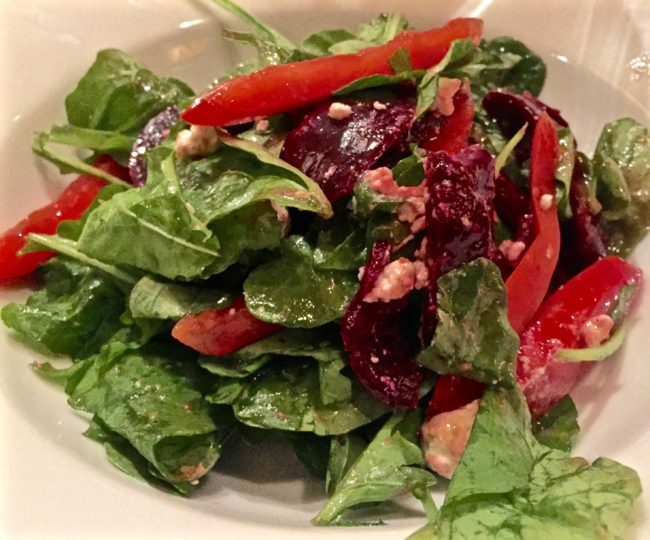 According to Tracy, “Nothing beats beets,” so she started with the Beets Salad ($11). For her entrée, she decided to go with a delicious Penne con Pollo, chicken, tomato, broccoli, arugula, mozzarella and basil ($15). After an Insalata Mista ($7), Marty said he thoroughly enjoyed his Penne Arrabbita, spicy marinara sauce, roasted garlic, parsley and red peppers ($14) with a side of two meatballs. 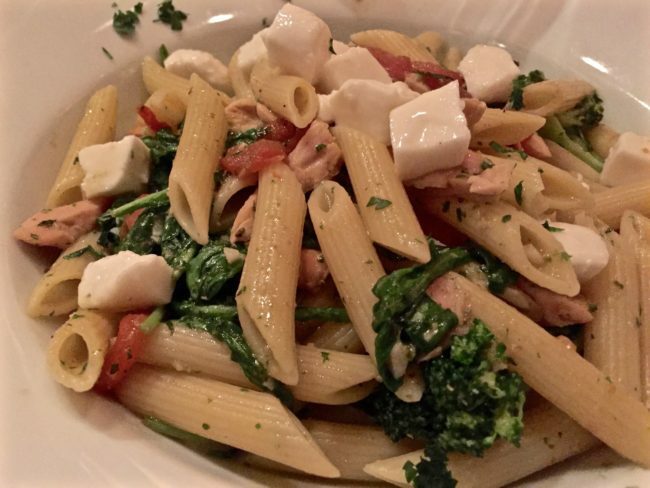 As expected from our chef (we loved his cooking at Gale’s), the pasta dishes were cooked to perfection. 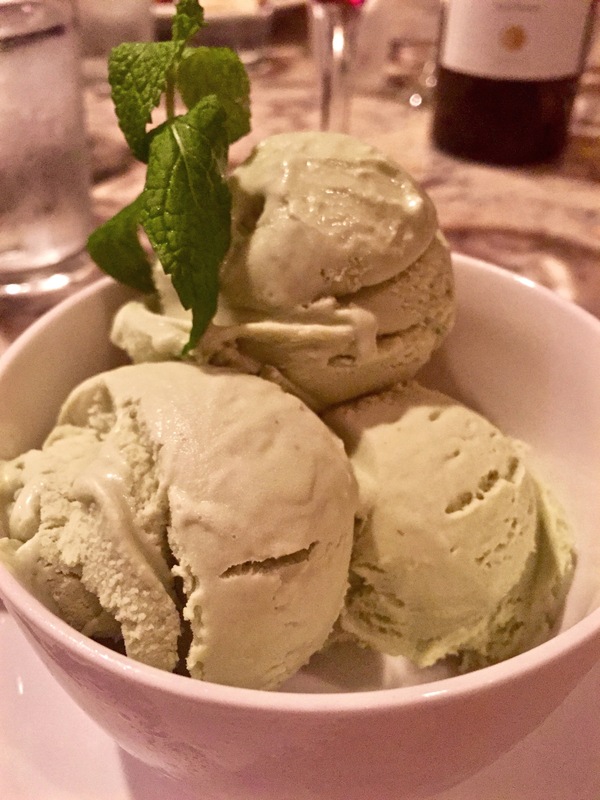 On this evening, we were unfortunately too full for dessert, but after perusing the menu, I knew I would try one of them on our next visit, which would take place much sooner than I thought. After our dinner with Kim and Marty, Tracy said that the food was so good, we should return here for her birthday dinner instead of one of the high-priced L.A. restaurants we had been discussing. Good food and saving money is always a bonus. On her birthday a few weeks later, we had 7 p.m. Friday night reservations, and when we entered, ours was the only empty table. This place was happening! We had asked for a table on the patio, but due to the rain we were seated in the dining room. 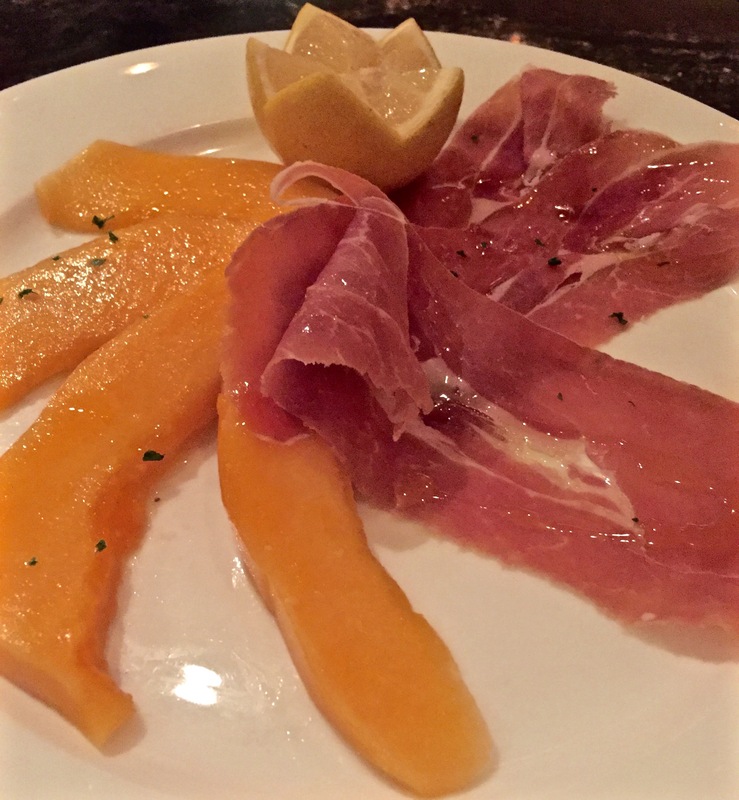 Trattoria Allegria definitely has a vibe, but it’s certainly not as loud as many restaurants we’ve dined at in the past couple of years. 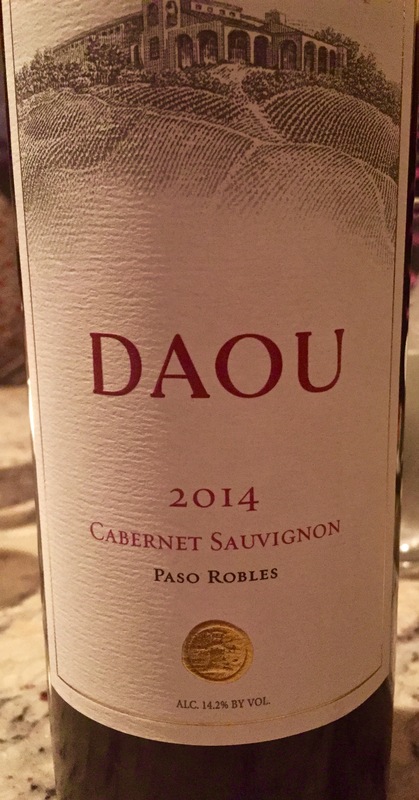 Our friends Paula, Burt and Susan joined us, and we brought a few bottles of vino ($15 corkage) to celebrate the occasion. Once again our dinner more than hit the spot. Burt and Tracy started with the Insalata Mista (mixed greens, tomato, red onion, pear, shaved parmesan with balsamic dressing), Paula ordered the Insalata si Cesare (classic Caesar salad, shaved parmesan with homemade croutons) and Susan enjoyed the Insalata Rucola (baby arugula, tomato, Parmesan and mozzarella cheese and lemon vinaigrette). 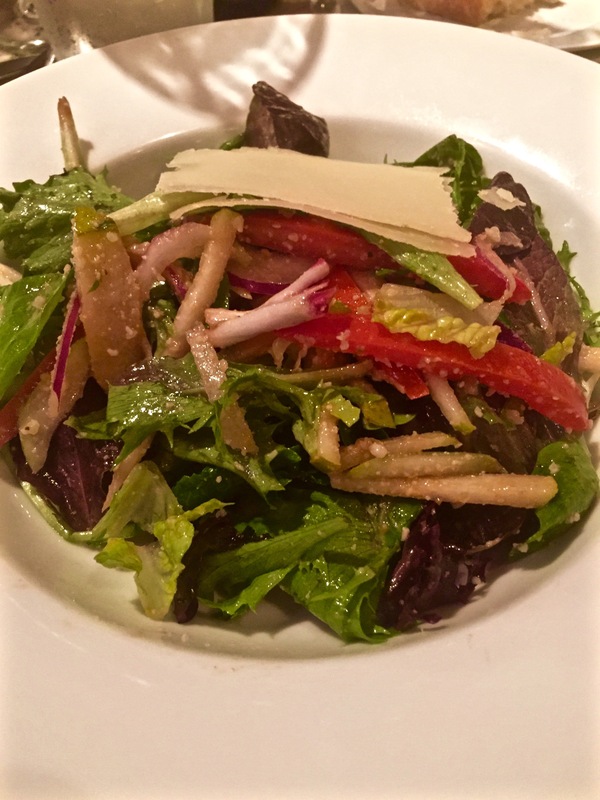 I felt sorry for the only Insalata not ordered, the Insalata Della Casa (romaine hearts, red onions, shaved parmesan with white balsamic dressing), so I promised I would order that Insalata next time. 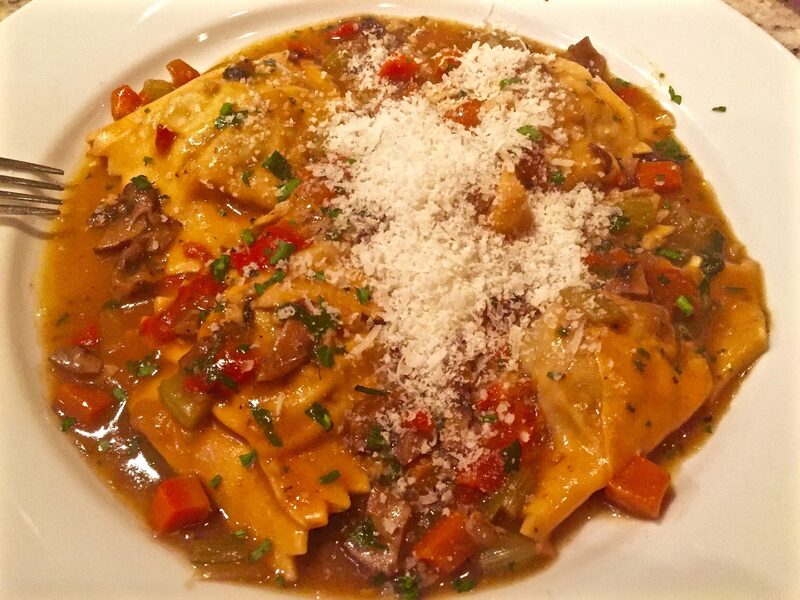 Tracy and Paula went for one of the specials of the day, Veal Ravioli, porcini mushrooms, roasted red peppers and osso bucco sauce ($20). They loved it, so much so that Tracy is now experimenting with osso bucco sauce recipes, which means I will be gaining osso much weight in the near future. 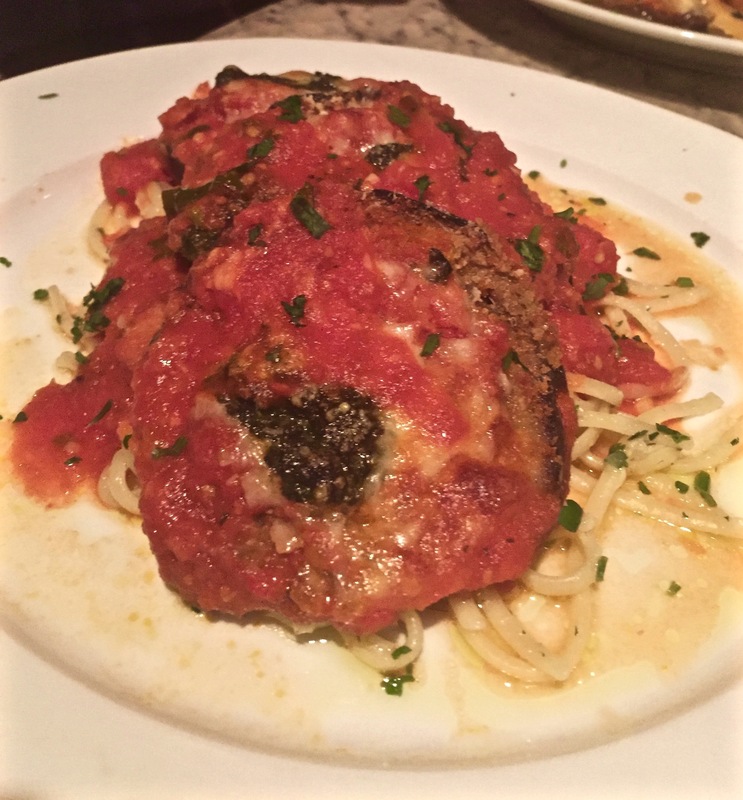 Susan and Burt both thought their Eggplant Parmesan, served on a bed of linguine, with olive oil and garlic ($16) was terrific. On this evening, I would go with three of my Italian favorites. 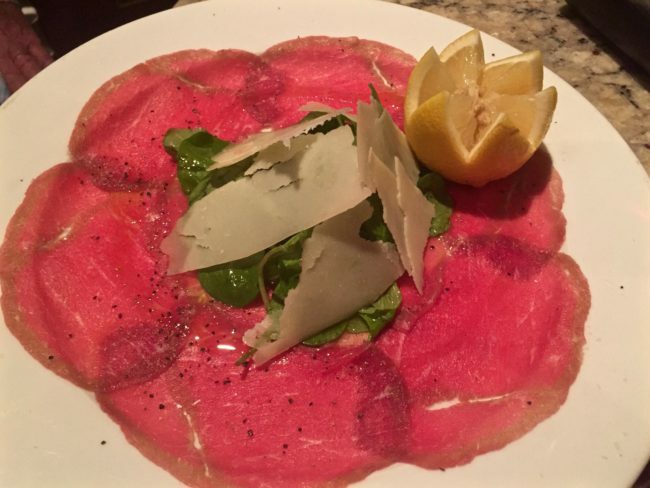 The Carpaccio of thinly sliced raw beef, shaved parmesan, arugula and drizzled with lemon olive oil ($11) was perhaps my favorite carpaccio ever. 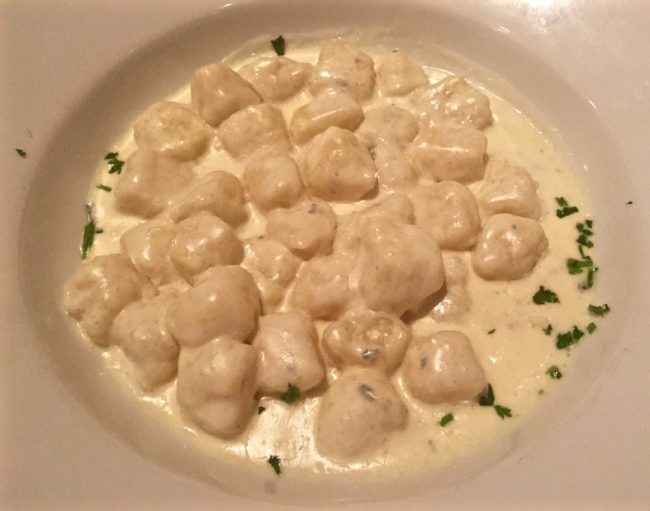 I admit it…I am a gnocchi addict, but the gnocchi on the menu is served in a marinara bolognese sauce, and I was really in the mood for a gorgonzola sauce on this night. I asked the waiter if it was possible for the chef to make it with gorgonzola, and after conferring with Chef Tinelli, he said they could. My “special” Gorgonzola Gnocchi cost me only a dollar more ($16), and it was heavenly. 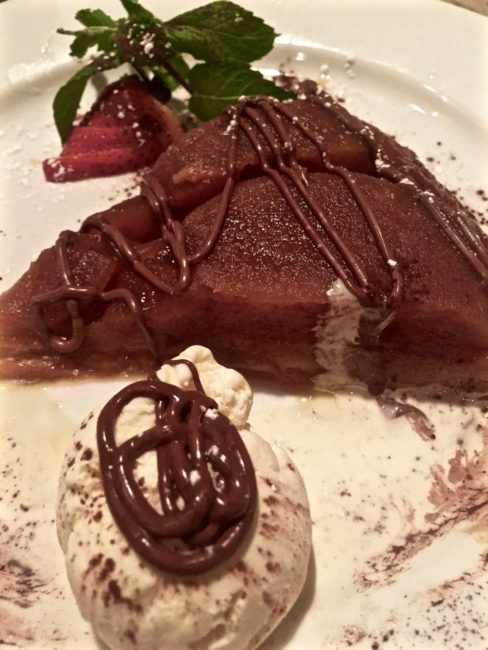 My appetite was still with me somehow after the delectable gnocci, and I had saved some room for dessert. 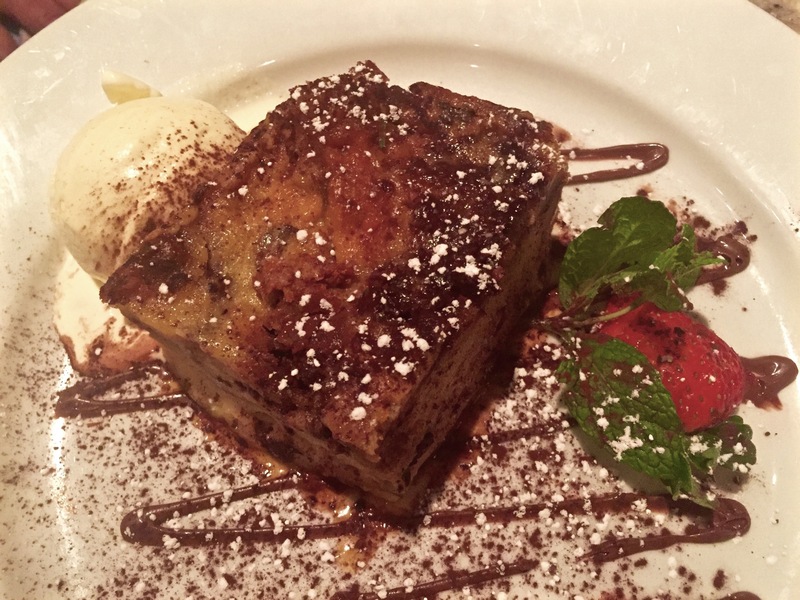 When I saw Panettone Bread Pudding ala mode ($8) on the menu earlier in the evening, my eyes lit up. It was incredible. Burt and Paula also devoured their servings. The only bread pudding I’ve ever tasted better is Tracy’s (recipe here). Susan went with a very good Warm Apple Torta di Mele a la mode ($8), while the birthday girl had three scoops of ice cream, vanilla, chocolate and pistachio ($6). With its great food and prices, I have a feeling Trattoria Allegria will be on our regular restaurant rotation this year. I’m a big fan of “neighborhood” restaurants, and this destination certainly fits the bill, which just also happens to be very reasonable here. The restaurant is located on Ocean View Blvd., only a couple of blocks south of Honolulu Avenue (technically Glendale) and occupies the second floor of a commercial building. There is parking in an adjacent lot (or on the street). 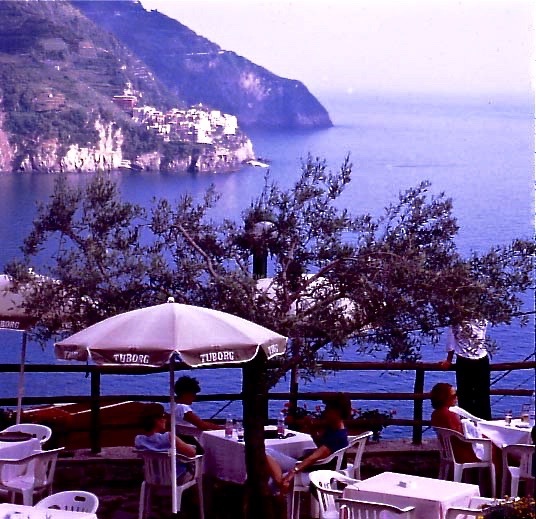 Both times we visited, Trattoria Allegria filled up completely, so I highly suggest getting reservations. 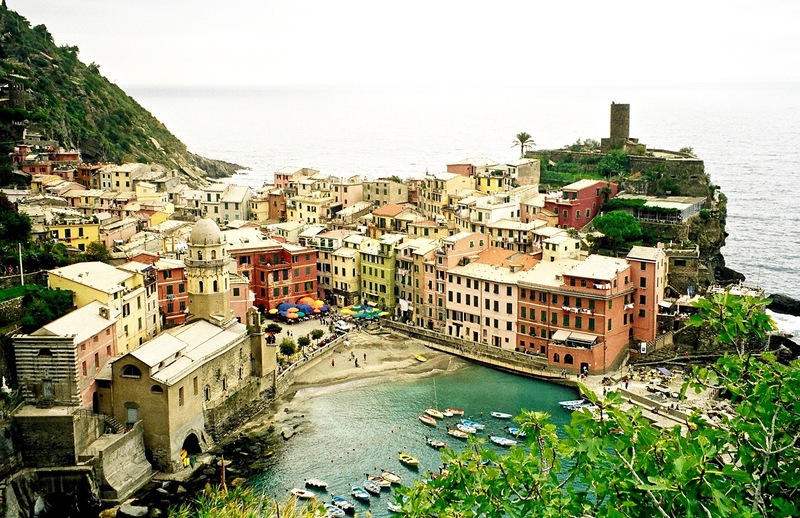 …it made me miss Italy even more. Thankfully, now I can make the short trip to Montrose and Trattoria Allegria to get my Italy fix any time I wish. Hours: Tuesday – Saturday, 11:30 a.m. – 10 p.m. • Sunday 5 p.m. – 9 p.m.